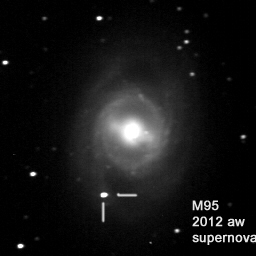 Here’s an image of a recent supernova in the constellation Leo. M95’s ‘new’ star was spotted March 16th by Paolo Fagotti of Italy. I’ve marked its position in the image I took Mar 22. I estimated the magnitude at 13.2 R.